As I discussed today on NPR’s Here and Now, the standoff between England and Ecuador is likely to grow worse after the latter country granted asylum to Julian Assange. While the government has threatened to strip the embassy of diplomatic status and grab Assange, it is in my view an empty threat. However, is there a way for Ecuador to get Assange out of the country? The assumption is that, once in Sweden, the United States would unseal an indictment and seek his extradiction. Given the increased use of secret evidence and military tribunals in the United States, there is an embarrassing fear among many worldwide whether Assange would receive a fair trial in the United States. The pressure from the United States is likely considerable despite the denials by officials. The British government has invoked the nuclear option by threatening to use a 1987 British law it says permits the revocation of diplomatic status of a building if the foreign power occupying it “ceases to use land for the purposes of its mission or exclusively for the purposes of a consular post.” The use of the Diplomatic and Consular Premises Act however would trigger an international outcry and beg for acts of retaliations. The the Vienna Convention on Diplomatic Relations requires diplomats to comply with the laws of the host country and international law does not expressly endorse diplomatic asylum in such cases. That 1961 convention suggests that Ecuador is legally obligated to turn over Assange. 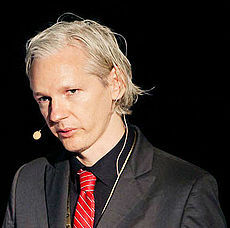 Assange has indicated that he may make a statement outside of the embassy on Sunday. That could be a fatal mistake if he steps outside of embassy grounds. This is not the time for a stroll if he wanted to stay out of custody. He could make a statement from within the embassy, though that would again raise claims from the British government that the embassy is being used for a non-diplomatic purpose. So does Ecuador have options? Yes, but they are pretty extreme and will raise some uncertainties. First, Ecuador could essentially mail Assange home. Under article 27 of the Vienna Convention on Diplomatic Relations, a diplomatic bag or diplomatic pouch is given diplomatic protection in carrying material or communications between a diplomatic mission and its home government or other official organizations. A pouch can be any size including a large container. It was must properly marked and locked. That was the failing in 1984 when Nigeria kidnapped and treated to send a former Nigerian government minister back to Nigeria in a pouch. Since it was not properly marked, the British opened the container and freed the captive minister. Ecuador previously had problems with such pouches. In January 2012, Italy arrested five people for shipping 40 kilograms of liquid cocaine in a diplomatic pouch from Ecuador. It is not clear how the Italians detected the cocaine or how the pouch was opened. Another even more radical possibility would be to give Assange Ecuadorian citizenship and then give him diplomatic status under Vienna Convention on Diplomatic Relations (1961). The problem is that such credentials are generally presented and accepted by the host nation. That could be a problem since Assange would legally appear as a diplomat within the country. Normally, once diplomatic status is established, the nation can only expel a diplomat as a persona non grata — something Assange would relish. However, the question is whether England would recognize him as a diplomatic even if Ecuador and Assange were willing to claim his citizenship and status. The assumption is that England would have to approve the diplomatic status to be certain that he could leave the country. Ecuador could try to send Assange to the airport in an embassy car with a diplomat. That should protect him on the roads to the airport, but simply walking into the airport would be a problem. There is the possibility that he could ride in a car through to Switzerland via the Eurotunnel, but the problem is that the embassy’s car park is separated from the embassy. He needs to get to the car even if the English are willing to respect the status of the vehicle. The easiest approach is for England to agree to “safe passage” but that would not please the United States or English officials keen on seeing Assange punished for his disclosures. That brings us back to the pouch and mailing Assange in a nice container with a comfy chair, bar, and of course wi-fi access. OS, when Anonymous gets done with them, perhaps the UK will be sending a limo to take Assange to the airport…..I wonder how much money this has cost them so far? No sympathy at all for them after they read that bully statement (straight from Hillary Clinton imho) about storming the embassy to get Assange. The UK Ministry of Justice web site is #TangoDown. Click the link if you must, but just now coming up crickets. What says he will get a high profle treatment? He could be held anywhere in CIAs network of black prisons, tortured, and die like others of “natural” causes. The next worse would be declared an enemy combatant, and housed in Guantanamo. Anonymously! A number and a rumor only. A pre-trial detention under terrible conditions which Manning haa been subjected to for over two years is his most optimistic chance. The organiztion and its techniques exists. Let’s hope it spreads. The strength of numbers again. How can the bearer of info on war crimes be scapegoat for the rage caused by humiiation? He pointed out the irony that his accomplices were world renowned newspapers of record: NYTimes, and others in Europe. They neglected their bit, but even so they are not being persecutted. I liked Assange’s appeal to pardon and recompense to all convicted or tried for “leaking”. Not to forget those crimes against us. Are there no safe Senators who are willing to spearhead a return to sanity. Like the one from Montana? Our press is already controlled. When is it completely paralyzed. The monologues issueing re Assange seemed biased to say the least. Trite but true. Let us assume that this guy is brought to Amerika and put on trial for … what .. espionage? For whom? The world? If I was him I would put as my first defense the First Amendment. The prong known as The Right To Petition The Government For Redress of Grievances. Well, he is not a citizen, so how his he petitioning his government? Well, then, if he is not a citizen then how is he guilty of espionage against the United States? He was never here. That may be neither her nor there to the prosecutors with their lame little views, but it matters to the world. He had a right to tell the world and the right to tell the American people of American Crimes. Lets keep Crimes in a capital sense since the American Crimes had to do with killing people, innocent people. So, yeah, bring it on AmeriKa. Dumb schmucks if you do. Just a quiet Preacher here. Telling it to the flock. Now conservative MPs are calling to end all aid to Ecuador. if you cant buy friends, cut off the money! Jeff Cohen was in London: ” On Friday, I visited Ecuador’s embassy here in the capital of the former British empire and saw a building surrounded by a phalanx of cops, with several of them at the front door. The embassy is in an upscale neighborhood near Harrods department store. The intimidating police presence was ordered by a Conservative government that waxes eloquent about the need to respect (British) embassies overseas. The intensified police deployment is only part of Britain’s response to Ecuador’s decision — after a long review — to grant political asylum on human rights grounds to WikiLeaks founder Julian Assange, who took refuge in the embassy two months ago. The British government has made it clear that it will not allow Ecuador to provide safe passage and asylum to an individual who — for the “crime” of publishing — has heard powerful U.S. voices in politics and media call for his murder. At the door of the rather small embassy, I was met by cops who interrogated me about who I was and why I sought entry. I had to wonder if the embassy was under siege by Britain on behalf of Washington, which reportedly stands ready to prosecute the WikiLeaks founder. Again, that’s for the “crime” of publishing — not sexual assault. It’s important to know that Britain’s Foreign Office recently threatened Ecuador in a letter — claiming a legal basis to go ahead and arrest Assange from the embassy after revoking the building’s diplomatic status. On Thursday, a prominent Conservative member of Parliament tweeted that Britain should break off diplomatic relations with Ecuador and then invade the “former embassy” to seize the WikiLeaks founder. A U.S. group I co-founded, RootsAction.org, is circulating a short online petition thanking Ecuador and protesting Britain’s threats against the embassy and refusal to uphold the right of asylum. I am glad someone did not forget Assange. He acquitted himself well. And took Obama and co. head on, endorsing and reminding of Bradley Manning and his illegal detention. And he spoke no word in his defense other than as a newspaper person, a caste now doomed to suppression IMHO. When all is against us, we need Assange and those who give him “proof of the sins of those in power” (paraphrased. I hope JT gets asked his opinion on the constitutionality of the persecution of the press in its role of revealer of sins against the populace. But it could be placed as a memorial to all the other mistakes they have made in Norway. The Obama Nobel Peace Prize cannot be re-used. There isn’t enough Brasso in the world to remove the tarnish.